If you are logged in as admin you cannot visit in the home_admin the following links "Adresssen", "Benutzer", "Neue Registration". 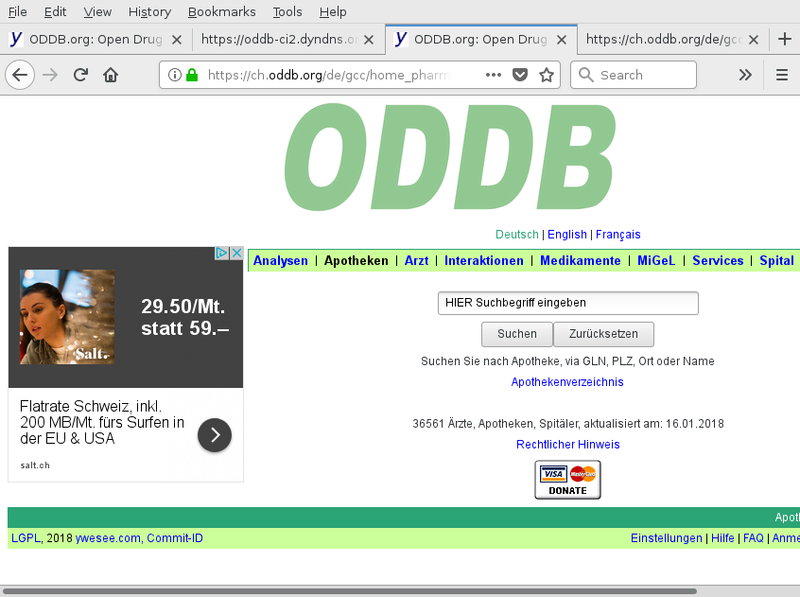 Also I see that on ch.oddb.org with Ruby 2.4.0 the https://ch.oddb.org/de/gcc/addresses/ are neatly sorted by time, descending, whereas in https://oddb-ci2.dyndns.org/de/gcc/addresses/ they are not and where I have many empty lines. Looks like entering address_suggestions does not work anymore as it should. The problem really originates that we use diffy to show the differences in src/plugin/refdata_jur.rb via changes['addresses'] = new_addr.diff(company.addresses.first). The jobs/import_swissmedic failed running export_xlxs as I did not have update /service/ch.oddb-export/run to use Ruby 2.5.0. Fixing this problem. Patch src/util/updater to run only the remaining swissmedic_followers and start jobs/import_swissmedic_followers. Changing ydim and ydim-html to use ruby-2.5.0 on oddb-ci2. Here I need a installed postgresql 10, as the newer pg gems need the new headers. Installing ruby-2.5.0 on thinpower using /usr/local/src/gen_ruby_250. Now all ch-oddb.org and ydim-services are up on thinpower. but nothing is show. Why? Does chrome block this?